Lord Ram was never a historical figure in Bengal as people believe in parts of north India. Perceptions vary in Uttar Pradesh and Bengal on this issue. For people in east UP, mostly avid readers of Ramcharitmanas by Tulsidas, Ram is as real as the sun, but it's not so in Bengal. In fact, Tagore wrote "Kobi tobo monobhumi Ramer janmasthan, Ayodhyar cheye satya jeno (the poet's mind is the birthplace of Ram which is more real than Ayodhya)." If you discount this as a "passing phase" of saffron euphoria after UP polls, think again. For, it appears to be a building up of a new narrative in which Hinduism stands for patriotism and secularism means Muslim appeasement. Unlike in 1992, when Kolkata saw a surge in Hindu passions after the Babri Masjid demolition, the VHP's rallying for Ram Janmabhoomi this time got some a social sanction. It touched the minds of a section of the educated middle class that's either irritated with, or insecure about, the rise of jihadi Islam. Knee-jerk reactions to the saffron brigade from the Trinamool are adding to polarisation. A change in Bengali word 'Ramdhanu' (rainbow) by the government in school books is one such instance. Environment lessons in Bengali in government approved textbooks for Class III have changed the word 'ramdhanu' to 'rongdhonu' to get rid of Ram. If this is one facet, the other move is just the reverse. 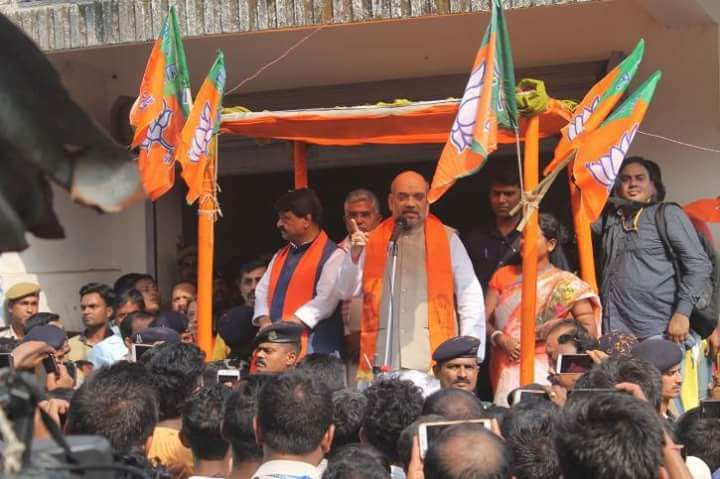 The recent South Contai assembly bypoll is a case in point, in which the BJP emerged as a clear second — far ahead of the Left and Congress that lost their deposits. The BJP's gain has a direct correlation with the vote shift from the Left. The Lok Sabha bypoll in Coochbehar held in 2016 showed similar trend. The Left seems to be caught in a time warp, failing to rally people under its broad class politics paradigm. Also, the Left's inability to inspire youth has added to their woes. "We've seen others, Congress, CPM and Trinamool. Let's see what Modiji can do," said IT manager Saikat Mitra. Modi has a package for everyclass is in disarray. Most of the times they go unheard." What's new is the BJP's inclusion of Dalits in the scheme of things. To send out the message to the ranks, BJP president Amit Shah had lunch at Raju Mahali's house at Naxalbari digressing from the past when the BJP was seen as an upper caste party. "Even backward Muslims are our target group," said state BJP spokesperson Sayantan Das. Shah, in his meeting with intellectuals in Kolkata, strummed the strings of cultural nationalism — an indigenous concept far removed from the idea borrowed from the West. The sub-text to this view calls for change in the secular, socialist tenets of the Constitution. Outfits like RSS, VHP, Hindu Samhati have taken up this cause to drive religious polarisation into a political polarisation that would lead to materialising the 'Hindu Rashtra' dream. The 'Hindu Rashtra' has little space for the other view. "It's often said Muslims who do not respect Bharat Mata should leave this country. I make my students sing the national anthem. But some want us to sing Vande Mataram which I can't enforce," said a Muslim teacher in Kolkata.